There is a great tool called Fritzing that allows you to create a breadboard view of circuits that you can use for documentation. I really wanted to use it to document the breadboard for my post on setting up a reversible counter, but no one had created a part for it yet. You can also use Fritzing to create schematic diagrams from your breadboard as well as create PC boards. So, I took a side journey down a very deep rabbit hole. Here's what I learned along the way. The final part is available on GitHub in my fritzing-parts repository. The first thing I noticed immediately was how helpful everyone is in the Fritzing community. The online forums are full of helpful people willing to pitch in. In fact, my part would not have been completed without the enormous effort of @vanepp from the Fritzing forums. I had spent three weeks of my spare time getting everything laid out in Illustrator and Fritzing before I was brave enough to "release" the part onto the Fritzing site. As soon as I did, I received instant feedback on what needed improvement on my part. 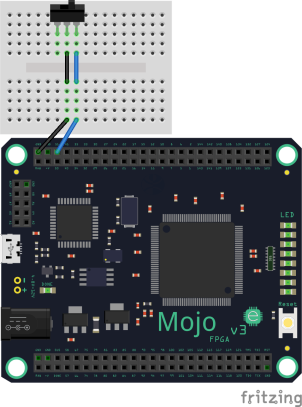 From there, I've had the assistance of a very experienced part maker working with my source files (which I had converted from the Eagle CAD software to SVG since Eagle is the format that the Mojo manufacturer used to create the board). Adobe illustrator has the ability to export to SVG. It retains the layer and group names, but some things just weren't translating correctly, so it kept causing trouble. It turns out that the community is mostly using Inkscape (an open-source (GPL) alternative to Illustrator) to make their SVG documents. I am going to learn how to use Inkscape and I will likely cancel my Adobe Creative Cloud membership. I already know how to use GIMP (the open-source Photoshop alternative). I'm not a graphics professional, but I'm paying a pro price to keep these tools. The only other product that I use from Creative Cloud is Premiere Pro, but I can just buy Premiere Elements to replace it. That will save me a lot of money each month. I jumped into this thinking "this should be easy, there are so many online tutorials". I was wrong. Even with the tutorials, there were some things I had to learn about creating parts. I accidentally deleted the first part that I created after wiring up 110 pins to three different views (that was over 600 mouse clicks after it was all over). There are lots of resources, but I'm a hard-knocks kind of learner, so my stubbornness cost me extra pain. The Illustrator part took me over two weeks of spare time to get right. I started with a high-resolution image of the board from the Embedded Micro website and edited it in Photoshop. I prepared it (changed color balance and contrast) for Illustrator. Once I had it in Illustrator, I used the image trace tool to create the beginnings of a long task. I replaced each individual component with hand drawn basic shapes (the image trace created complex paths that would have made an enormous SVG file). I enjoyed the part creation overall and I'd do it again. I think Fritzing is a great tool and I hope more people add more parts to it. A few years ago, I bought a Pebble smartwatch. Mostly I bought it because it was cheap, but I also wanted to write my own apps for it. I wrote a few apps.